How do any of us learn to cook? I have friends who are self acknowledged shockers in the kitchen and others who are chefs and produce dreamy food people pay for. I probably fit at the lower end of the scale through no lack of trying! In the eyes of my children I’m not too bad, probably because I know what they like and cook that well. Hubster on the other hand cooks… and I appreciate those nights because I don’t have to, the kids don’t appreciate it so much – I’ll soon see if he reads my blogs. When I was learning the ropes in mum’s kitchen, with lovely yellow doors and brown handles… she’d show me how to make my favourite dishes, give me tips and fill me with the confidence that I could cook anything. So when I was attempting my first Chinese stir fry I used her tip about putting in the ingredients you like. This tip didn’t come with the warning that these ingredients should compliment each other, probably assumed I had some sort of food commonsense. Not the case! In went the veges and the meat, followed by garlic (yum), a bit of worcestershire sauce, honey, soy sauce, a tad of sweet chilli sauce, cumin, mixed herbs, rosemary… and it went on. You can imagine the flavours of disaster. It couldn’t be saved, it was beyond redemption. Toasted sandwiches all round for dinner that night! I’m a great cook when I use a recipe. I’ll try anything, yep I give anything a go. 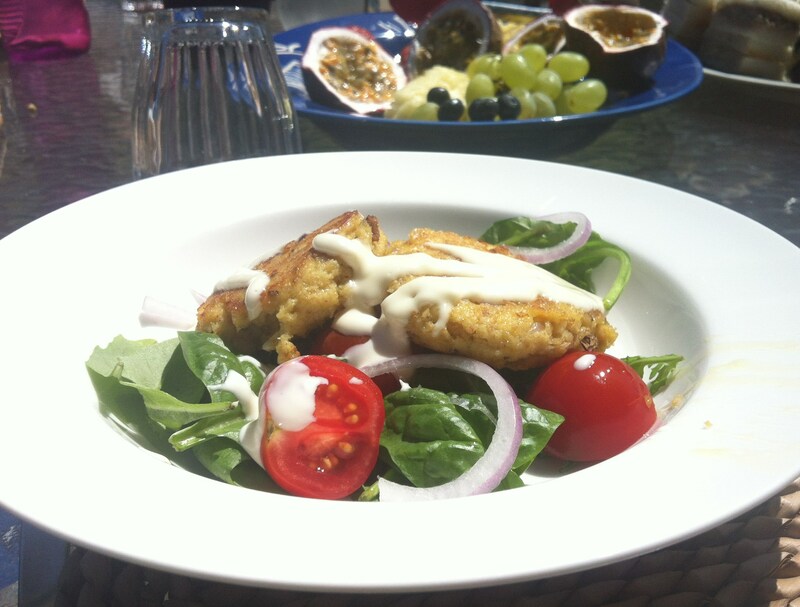 I actually found out that I like to cook when I had kids and started to meal plan, I wrote a little about this here. Then I found Taste, created my own cookbook on their site and started to store my favourites there instead of printing them out all the time and then getting lost. Then I turned to Pinterest and created a few boards. I keep my main meal ideas in the Yummy in my Tummy board. I used this to store any other recipes I found online – we all know that’s a bottomless pit. Other than Taste and my Pinterest boards I really only use one other cookbook. Now I’m not shameless plugging and it really is a cookbook I use at least once a week and lives on my bench. 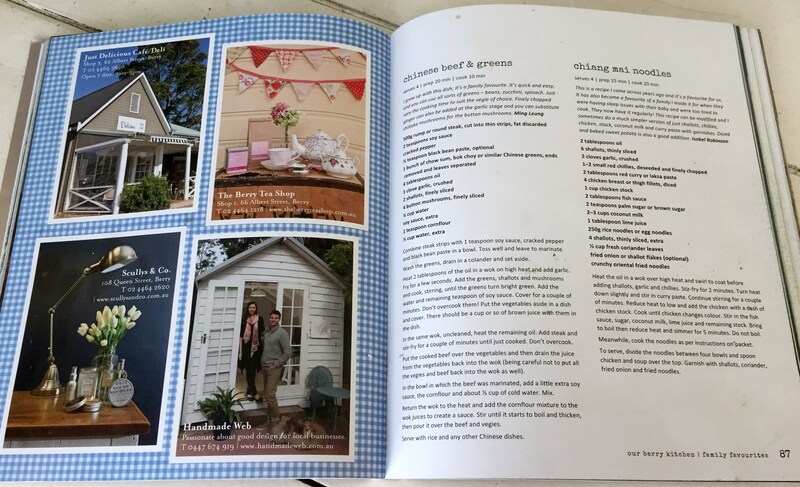 It’s called Our Berry Kitchen and was published a couple of years ago by some devoted parents at the school where my kids go, to raise money for some of the old buildings to be upgraded. My favourite cookbook “Our Berry Kitchen” is often left open on this page, which explains the splatters! It was during those day’s as I went back to work, that I learned the hard way about when was an appropriate time to try a new recipe. There were many meals we would eat at 8pm because I didn’t realise how long it would take to cook. Never good when a small child needs to go to school the next day. I like it when the kids want to help (well most of the time), especially with dinner as they are just at the age where they are actually helpful – sometimes. My youngest loves to peel and cut carrots, awesome. The oldest is great on the other end of a wooden spoon and keeping the stir action going. Some people are just so talented at some things and make it look so easy. I watched a girlfriend chopping away so quick and precise with a knife one day, wowsers! I suggested she set up a class for basic skills in the kitchen and I’d be the first one there. She laughed it off (even though I thought it was the best idea ever) and showed me how to chop. So now I practice and surprise myself at my growing skill. 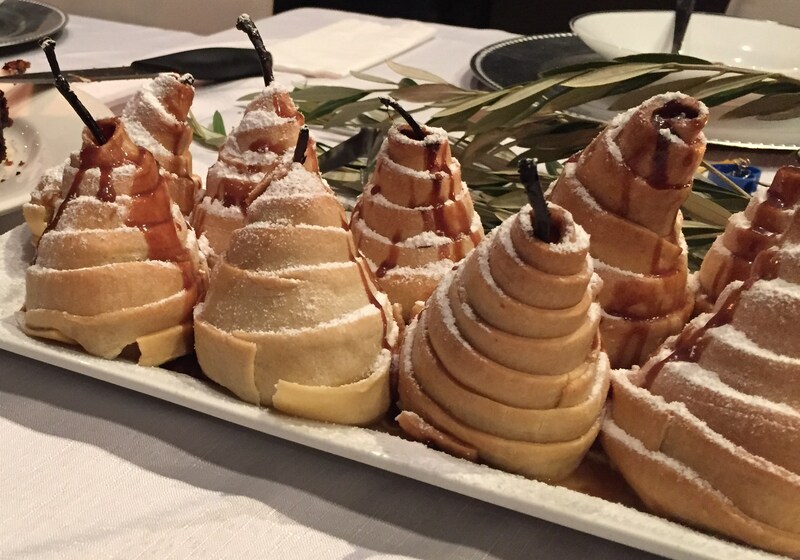 My clever girlfriend’s take on poached pears… oh yum! I enjoy cooking. I will try anything. Dodgy meals will be produced… but I will continually learn in the kitchen and love every single step.